I have no idea about what you're talking. Is it about those inadmissible apps at my tablet that wants me constantly to give it permission for knowing where I am, what I'm doing and who am I talking with? and more a half dozen things? It's "minimal app" because it has only the tab bar and combined address/status bar on the graphical interface. Otherwise it's keyboard-driven. Isn't it totally awesome how it unfolds the folder system and peeks into files? Then you can tweak the options under .config/ranger to no end Fantastic! But let's get serious. I doubt you would like these programs, even if they can be installed on your tablet or XP. It could be possible to install them, but too difficult to bother, and just a waste of time to try when you won't use them anyway. I don't like solitaire, don't play with real cards even less with a computer. To play it means that you're doing nothing with your computer just waiting time to pass by. I like programs/apps that empowers the user and not those that treats users as idiots. Examples: I prefer older versions of programs than the web 2.0 kind of thing. I like programs that do what I want instead of programs that pretends to know what I want and give me no option. I like programs with an "austere" interface and I don't like programs that seems you to have a kindergarten on screen. Basically I use a browser, text editor, spreadsheet, antivirus, pc maintenance, encryption and an image editor. I'm forced to use file managers and the such in order to work with the computer. Professionaly I had to work with many more specific kind of programs as CRM for example.. Also did, as Client Project Manager, software development and integration. It could be possible to install them, but too difficult to bother, and just a waste of time to try when you won't use them anyway. Is Uzbl your main browser? Is it your secondary browser? Neither I only had it installed for a little while. I prefer Luakit, because its configuration was easier for me to figure out. Luakit is about the fifth-most important browser I have behind Opera (11.62), Seamonkey, Otter and Elinks. Had I been able to figure out Uzbl first, I would have had Uzbl in the same function instead. As I use so many browsers, there are more functions to them than only "main" and "secondary". For example Opera is primarily for e-mailing. It's an internet suite, not a mere browser. Luakit is my primary replacement for Chrome/Chromium. The latest release of Luakit is from 2012, so I have been searching for a similar browser that properly replaces it. I found it in dwb browser. It has the same minimalistic toolbars, but the settings and configuration are nicely graphically displayed, so even total noobs can tweak it. Bookmarks can be imported as a list of urls in a plain text file. In dwb I got cookie and adblock settings immediately to work the way I want, different from Luakit where I couldn't get whitelists to work. All in all, dwb looks like a nice improvement over Luakit. I'm slightly confused. The screenshots make it look like a console browser? dwb browser looks like a console browser? That's confused, yes. It's actually a webkit engine with minimal (=buttonless) toolbars around it, meant to be driven with keyboard. Just like Luakit. The default home page in dwb takes you to keyboard settings and configuration options at first launch. I realize it's probably not, but have you seen this screenshot? That looks like Links 2 with better graphics. Incidentally, you can run Netsurf in the framebuffer. So it's not unheard of. Do you mean how the lines look at the bottom? That's what they call the popup. It contains stuff to select from so as to complete the line bottom-most. Works this way in Luakit too. As to running graphics in console, I have managed to make mplayer display a video in a highly pixelized manner in the shell. It was in Ubuntu. It worked just that once. But if it were up to me, anything that runs in console would not be called graphical. Things that run in console are console programs, not graphical. As to Netsurf, cool that it has a console mode. I have found Netsurf unfortunately unusable. It doesn't open up the railway timetables site that I need all the time. Well no, I mean everything except the actual website display. I suppose part of it might be xmonad or some such? But if it were up to me, anything that runs in console would not be called graphical. Things that run in console are console programs, not graphical. Whatever e.g. fbi is, it displays pictures just as well as any "graphical" picture viewer. As to Netsurf, cool that it has a console mode. I have found Netsurf unfortunately unusable. It doesn't open up the railway timetables site that I need all the time. I take your word for it. It would be a nice addition in this thread, but I just tried it and all it does is complain about some fonts, so it's subminimal. What has displaying of images to do with fonts? 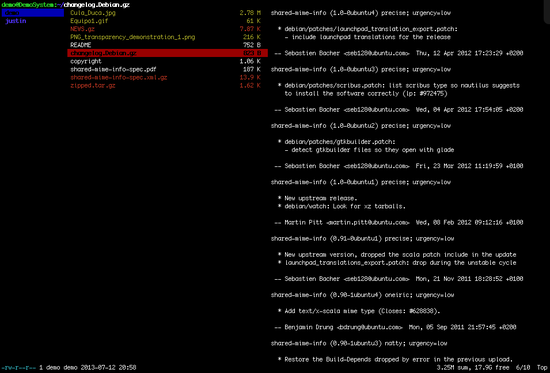 Imagemagick does many things in command line, but it still needs another window to display images. Edit: I just noticed the Netsurf framebuffer version is available in the package netsurf-fb. I'll give it a try sometime. Yes, that's the error message. I also tried 'fim', a derivative of fbi available in AUR. Fim also complains about fonts, but with a different error message. Makes no difference what terminal I pick or shell (tty), the same error messages. Sorry, I was probably unclear. The font thing is not an error message: it's just a message. Only the line underneath, "Inappropriate ioctl for device", is an error message. I'd show you a screenshot of what it looks like on tty (Ctrl+Alt+F1-7), but I don't know how to take screenshots there. Fair enough. Oddly, the automatic Dropbox picture upload function just says "waiting to upload". Waiting for what, one wonders. Wyrd is a command-line frontend for Remind. It's a nice little app for reminders, if your system is minimal enough so that you have no other app for reminders. and you'll have a nice config file to tweak. In that file (.wyrdrc), for example set week_starts_monday to "true" and see the weekdays laid out as they are supposed to. But reminders may be terribly advanced for most users. If you only need to see a current month display and your setup is so minimal that there's no other calendar app, type cal in terminal and see what you get. Rawdog is a console-based RSS feed reader. It's so basic that it can be considered outright clumsy. After installation it doesn't show up anywhere. It works by typing rawdog in terminal, but there's some configuration to be done before it does anything useful. The styles file will put CSS styles on output.html about which more soon. Rawdog will report if adding the feed was successful. You can add many feeds of course. The added feeds will appear at the very bottom of the config file. The -W argument is supposed to check something about the state and state.lock files in the profile directory. The -u argument updates the feeds. The -w argument writes the output. The output is output.html, a static HTML file. To view the feed, open up output.html in a browser. The style for output.html is in styles.css. Some other configurable parameters, such as the feed update frequency (rawdog -u doesn't really update more frequently than the period specified for the feed in the config file), date formats, etc. can be found in the self-explanatory config file. To see the latest posts at DND (and some other feed providers), I have made a command-line alias dnd that stands for rawdog -Wuw && elinks ~/.rawdog/output.html. Awesome when it works. Just a warning, looking up "rawdog" in a search engine has some... odd... results. Here's the website. And here's an outdated and probably incomplete list of command-line RSS thingies http://tinyapps.org/blog/nix/200708170700_command_line_feed_readers.html I haven't tried them all because some of them don't even seem to exist any more. Looks like DWB is also all but abandoned, maybe considered feature-complete or perfect already, and beyond need of maintenance. EDIT: And Qutebrowser adds a bunch of python dependencies. DWB is lighter to this extent. I found a setting that makes Qutebrowser's popup normal. The setting is called "shrink" in qute:settings. But I found another sad thing in Qutebrowser. The option for external textarea editors is there, but doesn't work, default or customised, nothing. And in tabulated calendar format. Calcurse is independent from Remind. Calcurse does todo lists that are actually called todo lists. This in addition to ordinary calendar appointments. It has a more modern look than Wyrd. A nifty feature in Calcurse is the ability to attach notes to appointments and todo lists (notes are not available in Wyrd). However, when the appointment item is moved or modified, it may get corrupted when a note is attached to it, e.g. the appointment's clocktimes may vanish. So it's nifty, but buggy. Even though Calcurse seems easier to navigate and is conveniently configurable inside the program interface, it does not seem to have more settings and preferences than Wyrd. Calcurse seems unable to show week numbers in the calendar. Wyrd can show them. Appointments view is painfully unconfigurable in Calcurse. It's just an unalterable day view. No way to navigate the hours. No agenda (list of future appointments). The downside is that when the item has no note, Calcurse prints out "No note file found", completely unnecessarily. In conclusion, neither Calcurse or Wyrd attracts me to migrate my calendar from mobile phone to computer command line. Calcurse seems more attractive, but its move function is not as reliable as Wyrd's. Both have shortcomings that still make me type cal -w3 or date -d 'next fri'.